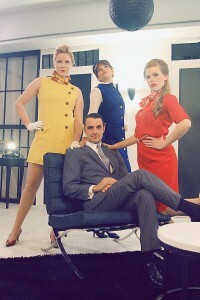 Boeing-Boeing is a charming comedy about a man named Bernard who has found the perfect compromise between monogamy and variety: three fiancés. All the women are flight attendants on different major airlines: Gloria (Kelly McCormack), the American girl; Gabriella (Diana Bentley), the Italian girl; and Gretchen (Brooke Morgan), the German girl. The entire situation (on this particular day) is held together by an overworked maid, Berthe (Eleanor Hewlings), Bernard’s friend Robert (Tim Walker) visiting from Wisconsin, and a very very treasured flight schedule. The show was first performed in London in 1962 and has been a hit ever since. Feminists take note: gender roles reflect an older time – the attitude towards women is markedly different than it would be in a piece written today. Put on by Rogue Theatre Co., the show was staged in a quiet and small location on the corner of Dundas Street and Euclid. While it may not look like much from the outside, the set was stunning. It was decorated as fancy apartment with a great deal of attention to detail such as lighting, furniture, and even well stocked liquor cabinets with clean glasses. What I didn’t realize until after seeing the show, is that director, Jeremy Hutton, also directed another great show I saw in the fall, Macbeth. It is staggering how different the shows actually are and how well they were both done. In this performance, the timing was impeccable – the physical comedy was excellently choreographed and never missed a beat. The performance was dynamic, the actors performances were quite physical (at one point a flying suitcase landed on my foot – didn’t hurt too much and is a necessary byproduct of a performance like this in a small space). But they really interacted with the set and each other and this brought the performance to life. I had a great time and would highly recommend this show – however it may not be appropriate for children. It is a nice alternative to a night at the movies and next door to Toronto’s Little Italy neighbourhood if you are hungry before the show. You won’t regret it. – Shows are Tuesday-Sunday at 8pm. – Ticket are $25/$15 for students (with student ID in person only).